Nova's continuing exploits under Dan Abnett and Andy Lanning get further into the family dynamics of the Rider family and the new Nova Corps. While I liked involving Robbie Rider, I kind of wish that the events of this book were spread out more. Nova's goes through two big personal changes in 6 issues and they lose a little of their impact. Seeing Nova use his smarts to out think multiple obstacles was very good to see because too many times he comes off as too headstrong. The art by Andrea DeVito and Kevin Sharpe was great. The book wasn't a huge part of War Of Kings but was a welcome chapter. Overall, another very good Abnett/Lanning sci-fi tale. So Nova always borders on being a ripoff of Green Lantern--I mean the powers are different, but the mythologies are just so similar. Anyway, in this volume, I just couldn't shake the Green Lantern feeling. It was too similar, and while it has a few decent moments, it's clear that the writers were spread too thin at this point. They were simultaneously writing the very good Guardians of the Galaxy and War of Kings and the terrible Darkhawk series; I think Nova just got put on the back burner.I just never really care about Nova--he's a generic, snarky comic character. (Actually, he seems like a lot of the other characters in this War of Kings thing--a couple of the Guardians, and Darkhawk in particular.) And since he doesn't have interesting powers, and his story is getting pretty derivative, well....And let it be said: the end of issue 25 is definitely some of the worst writing I've ever run across, when all of the conflicts of the previous issues are swept away in a couple of meaningless dialogue bubbles. "So, computer, now the we've thoroughly established that I'm going to die, and that this newfound thingy will make me a villain, should we be worried." "Nah, it'll be alright." Ridiculous. This is a good collection of stories, but by Nova standards, it's kind of ordinary. In the last few issues, Worldmind has been recruiting a swarm of new Nova centurions, and this volume is largely concerned with clearing them out. First, there's an intense scene, the part that makes this a War of Kings crossover, in which a number of new heroes learn the limits of their experience, then Abnett and Lanning take a few issues to peacefully pare the cast to a manageable number. There are some nice developments with Quasar (the Wendell Vaughn version), some backstory for a scientist from Project P.E.G.A.S.U.S., and some really well-executed character developments for both Nova and his brother. The success of the volume as a whole depends a great deal on whether or not the reader is interested in Ego, the Living Planet (I am not), but it should satisfy both long-time cosmic Marvel fans and anyone who has been following this most recent Nova series closely. Richard Rider as Quasar! Wait not Nova? Nope. He gets the bands of "Go with the flow, man" and it's actually pretty fun while it lasts. We finally get real answers on what's going on with Worldmind. I was a bit surprised but that could be because I don't really know the history of Ego the Living Planet. It was a nice turn and we of course get Riser back as head Nova, which is where it had to go, of course, I think I liked this better than the main War of Kings book. Probably because I read them both together. This may have made far less sense if I had and who knows how I'd feel. The Nova Corp is actually coming back now and hopefully it'll be something cool, but seeing as the series ends next volume, I'm not overly hopeful. More solid Nova comics. This one runs in parallel with the War of Kings storyline, touching on events from that, but without really interfering with the events there. In this case, I sort of wonder why not, since it would make a lot of sense to get involves with it, particularly at the end. Still, there is at least some explanation there, and it reestablishes the Nova corps as a presence in space, so that is a plus. Hopefully, that will result in a greater integration with the rest of the cosmic sections of the Marvel universe. A thoughtful resolution of the previous volume as Nova finds a lifeline and discovers his fears regarding the Worldmind are justified. The volume has a pretty mature take on the meat grinder of war, as new recruits are sent into action they're not ready for. The big characters--brother Robbie included--get their star turns, and the volume ends on a nice piece of realpolitik. Well done.Read digital version. 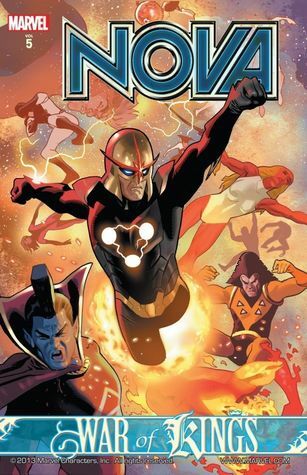 The nova corps try to stop the big war. Only problem is that most are too young and inexperienced to fight. Meanwhile, Ego is making his presence known. A decent story with engaging characters, and it easily introduces the concept of nova to new readers. A good read. Nova back in space and the corps cut down to only a few members keeps the book alive. I was way out of context here and felt like I was missing a lot of things (which is one of the problems of this series, unfortunately), but still enjoyed it.